I absolutely loved The Iron Duke and Here There Be Monsters. When I first read those two books, the world building in Meljean Brook's science fiction romance, steampunk world hit me like a two by four, and I fell in love with the characters that inhabited that world. In Riveted, Brook adds to that world building by stepping away from England and the New World and moving her story to isolated Iceland, incorporating a bit of Norse mythology, characters that are just as different as the location, and stepping up her use of social science fiction in this steampunk installment. David Kentewess is leading an expedition to survey and map volcanoes in Iceland, but his one real mission for the last twenty years has been to solve the mystery of where his mother came from so he can keep a promise made to her on her deathbed. While waiting to board the airship Phatéon, he saves Annika Fridasdottor from a tricky situation at the gates of Castile, and finds that her accent and manner of speech match his mother's. Later, the runes she wears on her neck are also a dead giveaway. This is the closest David has ever come to keeping his promise and he's not about to let Annika slip through his fingers. Annika Fridasdottor is also on a mission. Her family, comprised entirely of women, have lived in a secret and secluded village in Iceland guarded by tales of trolls, witches and magic. Five years ago she almost revealed that secret while woolgathering and dreaming, but her sister Källa took the blame and was exiled in her stead. Annika took responsibility, joined the airship Phaeton's crew and has been searching throughout the New World for her sister ever since. 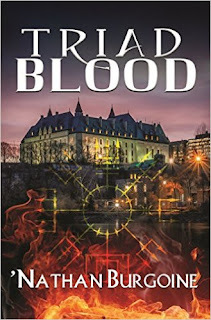 She is grateful that David saved her, but Annika endangered her family once, and after what she has observed of New World judgments and beliefs, is not about to do it again. The story begins at a slow pace with David and Annika getting to know each other. Annika gives away much about herself just by the way she speaks. In the proper New World, Annika is considered improper and bold while in other ways she's shy and secretive. Annika doesn't quite fit in with others and stands out. Her upbringing has much to do with her behavior, however as we find out throughout the story, Annika doesn't quite fit in with the women in her village either because there she is seen as Annika the Rabbit, or a weak and timid girl, not bold or brave. Soon Annika is very attracted to David and lets him know in her own way, but he doesn't really see it and there is a good reason for that. David's background is just as intriguing as Annika's. David is a gentle man, tender and loving, not an alpha male or even what I think of as a beta, but gentle. He lost his mother as a child and was brought up by his Native American father in a community where Native Americans were attempting to regain their culture years after their ancestors had converted and changed their names. David's father was a good, forgiving man and David a happy child even after he suffered the devastating loss of his mother, three of his limbs and an eye after a volcanic eruption. However as an adult, he is a man with baggage and not all of it is on the inside. After he grew to be an adult, David visited the Blacksmith in England so he is not only infected with nanoagents, but the Blacksmith grafted prosthetics on his missing limbs as well as an eye that looks like, but is not, a monocle. Most people look at him either with pity or as if he were a monster, and David is very self-conscious of his looks. The best thing about these two outsiders, gentle David and improper Annika, is that although they don't seem to fit anywhere, they fit perfectly with each other. They both see each other as worthy of admiration and as the adventure gains momentum, a deep, passionate, sweet love takes over where in the beginning there was only a deep attraction. The action in the story is slow to come as they travel all the way from Castile to a glacier in Iceland. It builds with the help of some excellent secondary characters rounding up the story and a hateful madman as a villain. The steampunk details are as excellent as I expected after reading previous installments, but in my opinion did not overwhelm the overall storyline. I particularly like the way Brook incorporates the women in Hannasvik and their culture with a bit of Norse mythology, and that she also uses that same culture to add some of that social science fiction I previously mentioned. The villain's fate and the consequences to his actions are anticlimactic. However, it is interesting that the scenes that follow with Annika and David seem to be the real high point of the story, so that in the end Riveted read and felt more like a true romance. A sweet romance at that! The Iron Duke and Here There Be Monsters are still my favorite reads of this series so far, but I really enjoyed the differences I found in Riveted and for me it comes in at a close third. Now, I'm really looking forward to reading the next book and can't wait to see where Brook takes this series. I've got this one and can't wait to read it! Thanks for the great review. Tracy, I think you'll love it, particularly since you've enjoyed the other books. :) Enjoy! Hi Hilcia - There you again writing a review that perfectly echoes my thoughts! And unlike me you articulate them so wonderfully :) I love that you categorized this series as "social science fiction", SO apt for the type of characters and situations Meljean Brook writes. The villain's..um demise? was completely anticlimactic , so much so that I wasn't sure what happened to him! in fact I had to go back and reread that section. Lol. Have you read the "Mina Wentworth & The Invisible City" novella? I thought it was a great "epilogue" so to speak for "The Iron Duke"
Negine, Brook is quite deft at social sci fi, at least that was so in The Iron Duke and I think she did an excellent job of it in Riveted too, although here it will be much more obvious to most readers in my opinion because of the issue she addresses. RE: The villain. So I was not the only one who had to re-read that part? LOL! Hi Hils, Loved the review. Wondering if the series be read in order or are the books able to stand alone? I picked this up not knowing it was a series and now I'm thinking that I should order the first two. Thanks! Well, the book sounds pretty awesome and I keep hearing good things about it but I don't why I don't like these covers, I just find them funny looking. That being said, I think I need to try this author soon! Alex, these books are really good steampunk romances. If you enjoy that sub-genre, you'll love these. 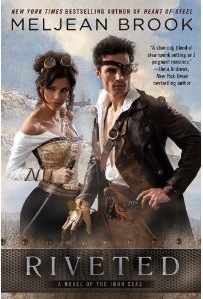 But, I know that even some readers who haven't enjoyed steampunk romances in the past have enjoyed these a lot. I'm a Meljean Brook fan, so yeah... to me this is a "must try" author. LOL! Skipped your review because OMG! I still haven't read The Iron Duke. Bad fangirl. BAD! Oh, Christine! A fan and you haven't read this series yet? Bad fangirl!! LOL! I skipped over the review, Hils, but I'm really glad you enjoyed it! I've heard really good things about Riveted, especially the romance, and it sounds soooo promising!! :) Can't wait to get my copy! Nath, I'm so glad you're going to read this book. I hope you enjoy it as much as I did -- especially the romance and the H/H. :D Enjoy! Leslie, yes... I understand your reluctance. I read Heart of Steel after reading Riveted this last week (out of sequence). I don't know if I would have continued the series if I'd read the books in order. It's not my favorite either. But yes for me, the romance in this one trumps everything else.